Meemic and Andy Steensma Insurance Agency proudly recognize Luke Wilcox as the 2017-18 Michigan Teacher of the Year (MTOY). Luke is a math teacher at East Kentwood High School. The MTOY award is a prestigious honor that focuses public attention on excellence in teaching. Meemic Insurance Company has been a proud sponsor of the Michigan Department of Education Teacher of the Year program since 2007! 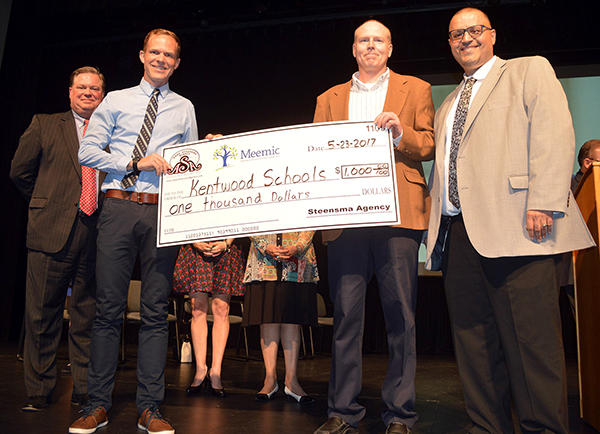 Keith Steensma was on hand to help present the award, which came with $1,000 for the school.